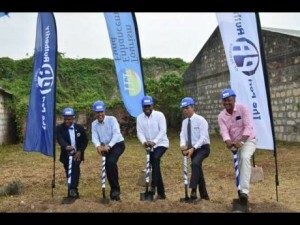 Several weeks ago, the Jamaica Environment Trust (JET) showed a short documentary related to its Nuh Dutty Up Jamaica campaign. Now, this is (or was) more than just a catchy tune and a strong public education message. It was about ongoing projects on the ground, which will now dry up as the Tourism Enhancement Fund (TEF) has withdrawn its funding. Behavior change is difficult, we know. But with the right incentives and the right kind of leadership on the ground, it can be achieved. The community members from Nine Miles in St. Ann, who attended the film show, had their priorities straight and had put the “infrastructure” (to coin a word that our Tourism Minister is fond of) in place to make the whole area a more pleasant place for Bob Marley fans and others to visit. Nine Miles is the site of Marley’s mausoleum. Anywhere related to Marley is automatically a major tourist attraction, as I am sure our politicians know. Now, Minister of Tourism Ed Bartlett has announced that the Tourism Enhancement Fund (TEF) – the major funder of the campaign, alongside Wisynco on the private sector side – will be more “strategic” in its funding. It will be “repositioned.” It will focus on entertainment, shopping, the cuisine at “fine eateries,” and the like. 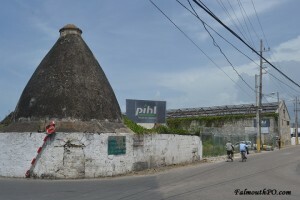 The Phoenix Foundry (Dome) in Falmouth, along with a hideous billboard and a broken street sign. This building, over 200 years old, is slated for “adaptive reuse.” Why not as a mini-museum? We might have a few artifacts to put in there. TEF will also now be doing data collection (which I would have expected was already being done somewhere at the Ministry). The Minister mentioned something about buildings and lots of infrastructure development. We clearly don’t have enough concrete in our tourism product, in Mr. Bartlett’s view. 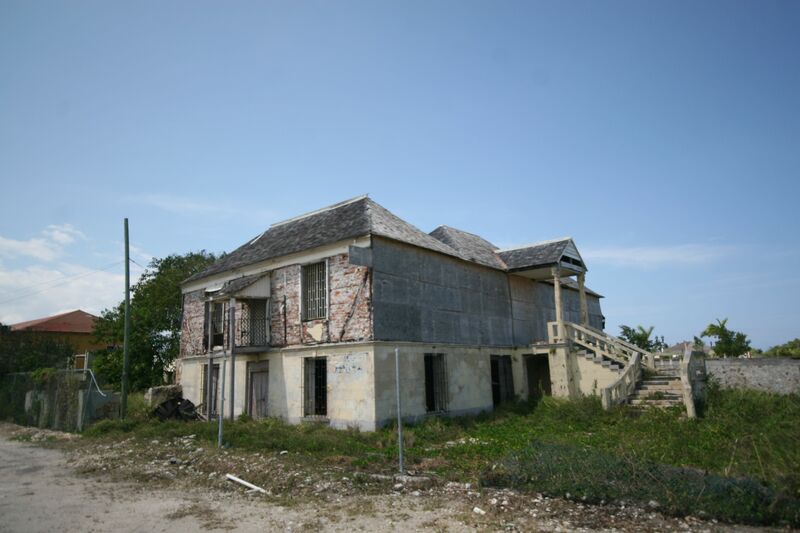 Take the crumbling town of Falmouth, Trelawny, for example – once the hub of a thriving sugar and slave trade. I am not sure what “adaptive reuse of historic buildings such as the Dome Foundry and Tharpe House” will consist of. Hopefully, it will be something reasonably tasteful. A large amount of funding from TEF will be plowed into the Hampden Wharf area of the town. This is a new project for cruise ship passengers, for which ground was broken on March 16. There is the usual emphasis on “landscaped” areas (let me guess – lawns that have to be maintained with scarce water, dotted with non-native palm trees and a few bougainvillea bushes); paved walkways (more concrete); and, who knows – perhaps more fake Georgian buildings in the town, after the original old ones have been allowed to rot and collapse over the years (such as the Barrett House, built in 1799). This development is to the tune of J$550 million. No wonder there is no money left for JET projects. We would rather “beautify” specific areas for tourists than clean up our own filth and encourage our own citizens to take pride in their surroundings. What relevance does that have to our tourism product, after all? Clearly, none. Minister Without Portfolio in the Ministry of Economic Growth and Job Creation, Dr. Horace Chang is excited about the development, which will include a “seamless interface” between carefully selected local craft vendors and the cruise ship passengers, he says. It’s called “sustainable tourism,” according to Dr. Chang. What does the word “sustainable” mean in this sense? The environment can take care of itself. This includes the marine environment and what remains of our wetlands. In Falmouth these have already suffered from pollution and destruction by cruise ships grounding themselves on the coral reef, clumsy dredging, the removal of mangrove and seagrass beds, and more. Minister Bartlett has a great way with words. At a recent workshop, in between photo ops, he declared that Jamaica is destined to become a “smart tourism destination” (what does “smart” mean in this context? Technology?) It will launch a new J$30 million website. Minister Bartlett believes that the tourism industry is going through some kind of revolution and that there is a “new architecture” for tourism (more buildings, perhaps?) I think he means technological advance. But, I ask you – is this what tourists are looking for? And yet, we cannot pick up our garbage. As I have said many times before (and I will say it one last time) tourists do notice the garbage that adorns our beautiful landscape. Visiting family members and friends always – always – mention it, almost apologetically. Yes, we do have a problem with garbage. My mother once refused to sit on a public beach (I won’t name which one) which was festooned with, among other items, discarded diapers. I remember feeling profoundly embarrassed when I saw a tourist in one of our north coast resorts taking a photograph of a gully filled with slime, scandal bags with unpleasant contents, and a stray dog picking its way through. 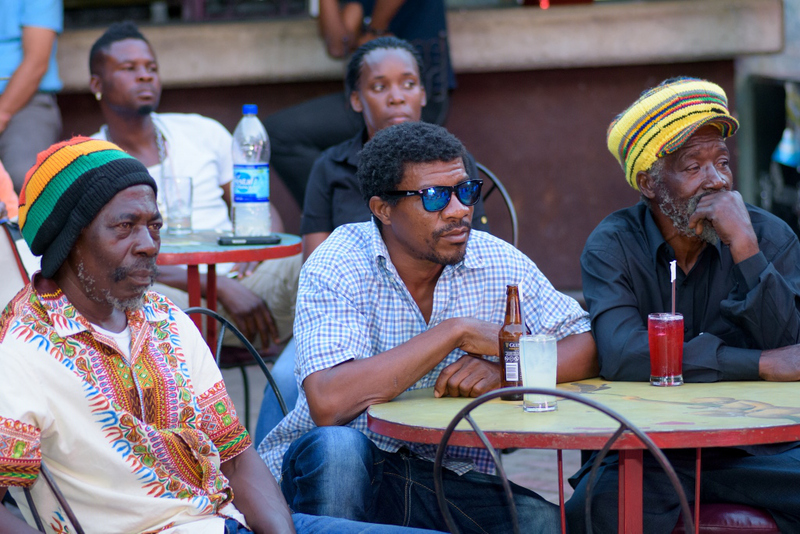 Jamaicans have developed a knack for gazing straight past a pile of plastic bottles and styrofoam containers at the beautiful view. We tune it out. Visitors do not. They see the garbage first. Tuesday, June 5 is World Environment Day. The theme? #BeatPlasticPollution. I am hoping that the multi-million dollar development in Falmouth might market itself as a “plastic free” environment, but I am not optimistic. Perhaps TEF, in its new role, can start collecting data on the amount of waste generated by tourists in their monstrous cruise ships. More tourists equal more waste. Perhaps environmental sustainability and efficient waste management could be the “seamless interface” we are looking for, for tourists and locals alike. All would benefit. Oh, have we thought about climate change, Minister Bartlett? Jamaicans need to clean up their act whereas garbage is concerned. It pains my heart to see them always discarding their trash in the most nonchalant and uncaring of ways. Wise up people- Soon fly weh lef dis. Oh, boy! Nonchalant is the word! “Ah no nutten” kind of attitude. We do need to get smarter, I agree.